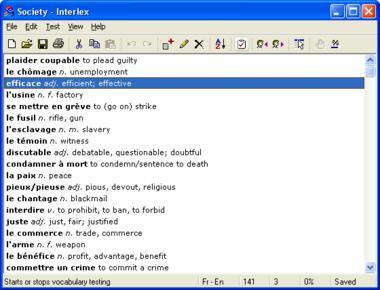 Interlex is a freeware vocabulary builder that helps you learn foreign words and phrases quickly and easily. The program is built around a simple idea: first you compile a list of words and phrases, then you test yourself until you have learnt them. 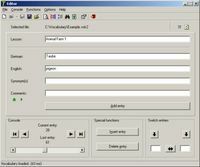 You can use Interlex to create bilingual vocabulary lists in any two of the following languages: Afrikaans, Albanian, Basque, Belorussian, Bulgarian, Catalan, Croatian, Czech, Danish, Dutch, English, Estonian, Finnish, French, German, Greek, Hungarian, Icelandic, Indonesian, Italian, Latvian, Lithuanian, Macedonian, Norwegian, Polish, Portuguese, Romanian, Russian, Serbian, Slovak, Slovenian, Spanish, Swedish, Turkish, Ukrainian. 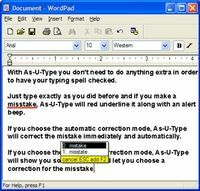 The main features of Interlex are: targeted testing in 4 different modes; multiple translations in native language; intelligent evaluation of alternative responses; informative feedback using text, colour and sound; powerful editor with Undo, Sort, Find and Print commands; automatic keyboard and font selection; selection of ready-to-use vocabulary files for French, German, Italian, Portuguese, Russian and Spanish; wide range of user preference options; context-sensitive Help and daily tips. Interlex provides a highly focused, interactive learning environment that allows you to improve your language skills rapidly. Creating your own Interlex files is an excellent way to explore a language and become familiar with new vocabulary. You can then commit this knowledge to long-term memory by testing yourself in a variety of ways. Words and phrases are carefully selected with reference to previous input, encouraging you to concentrate on those you find difficult. Feedback is immediate and informative, without any distracting special effects. The overall result is a tangible sense of progress that makes vocabulary learning a pleasure instead of a chore.